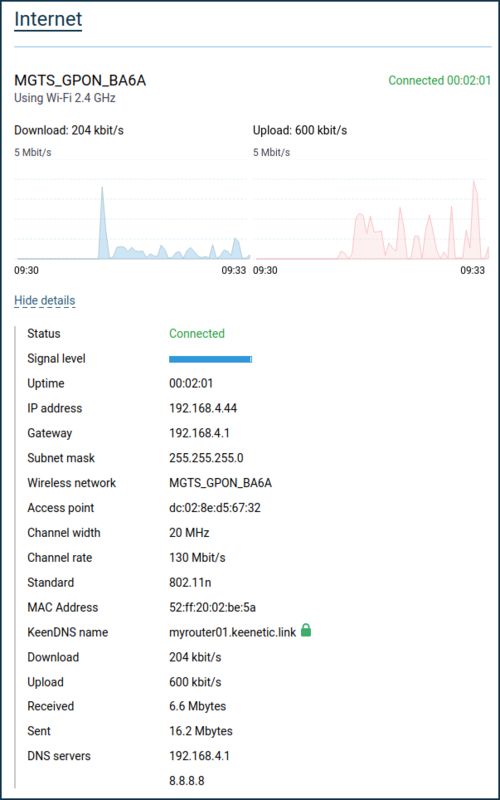 If you need to connect your home network to the Internet via a Wi-Fi link, every model of Keenetic router allows that with a WISP (Wireless ISP) mode connection. You can connect, for example, to ISP's public Wi-Fi hot spot, your neighbour's Wi-Fi network, a wireless in a nearby cafe, or to a mobile hot-spot on your smartphone. When travelling, WISP mode is convenient to use with a hotel Wi-Fi network. Your Keenetic connects to the hotel's Wi-Fi and all your mobile devices are good to go, already being connected to a pre-configured, secure Wi-Fi network of your router. The WISP connection can be used as a primary or backup connection, which is automatically activated in case of problems with the main Internet access channel. This type of Internet connection is set up on the 'Wireless ISP' page. In Keenetic models that are supporting dual-band wireless, this page provides two tabs, i.e. 2.4 GHz WISP and 5 GHz WISP — to allow configure the connection in the appropriate range. On the 'Wireless ISP' page, click 'Scan for a network' to select the desired wireless network. The window that appears display the available Wi-Fi networks within reach of the router. Select the desired network by a click on it. This will take you back to the Wireless ISP page. 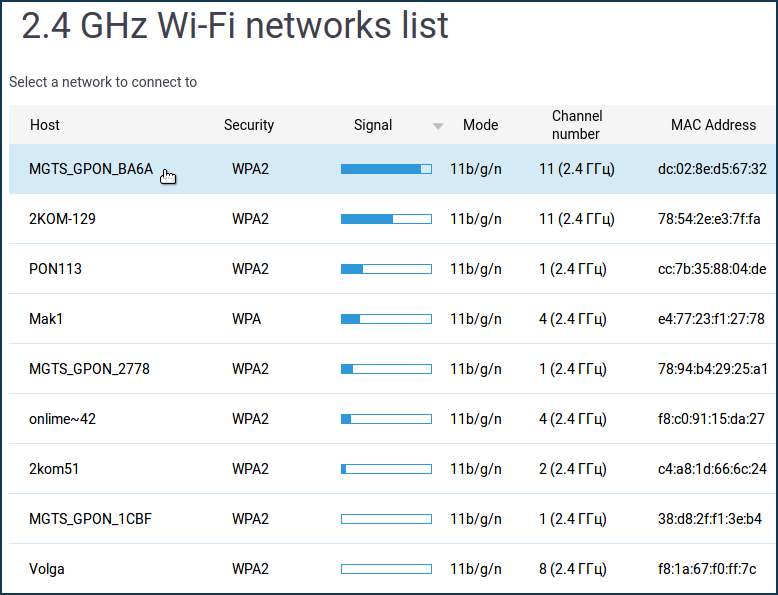 When you selected a wireless network, the 'Network Name (SSID)' field and 'Network protection' selector are automatically set. In the 'Password' field, you must enter the password or the security key that is used to access the selected Wi-Fi network. NOTE: Important! The IP addresses on the router's home subnet (default network assignment for this segment is 192.168.1.x) and those received from the Internet service provider or an uplink access point must belong to different subnets. Otherwise, an IP address conflict will occur and there will be no access to the Internet. 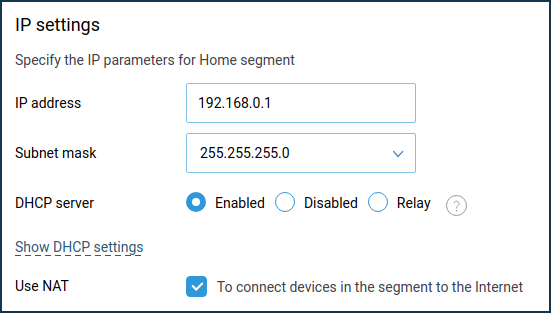 To change the local IP address of your Keenetic, go to the Home segment page, and in the IP Settings section fill out the IP address field — enter a private IP address other than 192.168.1.1 (e.g., enter the IP address 192.168.0.1). Apply setting by clicking the Save button. NOTE: Important! After you change the IP address of your router, you will lose access to its web interface. To regain access, you need to update the IP address of the network adapter by unplugging the network cable from the adapter for a minute. 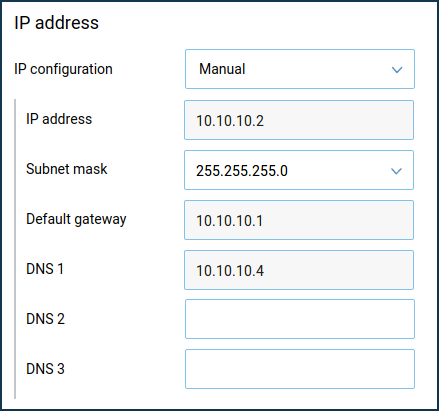 Then make sure that the IP address on the network adapter has been assigned from the new subnet and that the Keenetic web interface is accessible from the new local IP address. Set the Internet connection switch to right (On) position to start the WISP connection. After successful connection, click 'More details' in the 'Internet' information panel on the 'System dashboard' home page for more information on the current connection. The Wireless ISP connection can be used as primary or for a backup. When using connection backup, and the Wireless ISP connection is configured as the primary connection, on the same page you can enable Internet availability checking (Ping Check). Then, even if connection to AP remains but the internet connectivity is actually lost somehow, the Ping Checker will get around that and automatically switch the router to a backup connection. TIP: Note: Since KeeneticOS version 2.13 it is possible to set the MAC-address of the access point (it is also called 'BSSID') to connect to in WISP mode. This feature is useful in case there are access points broadcasting the same network name (SSID) on the radio. You can select a specific connection point of the infrastructure by manually entering its MAC address.